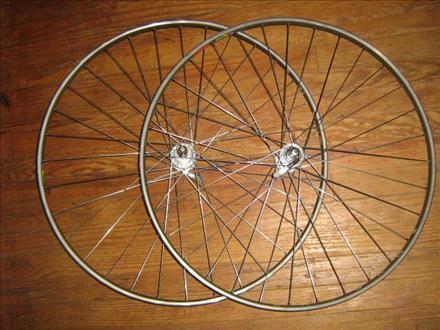 This wheelset was built by Wheelsmith for the 1984 USA Olympic road race team. Wheelsmith spokes, Specialized sealed bearing hubs and Italian Saturn HT-C21 tubular rims. This particular set was a reject because the rear wheel was one spoke off so it had a spoke crossing over the presta valve hole. I should have left it that was but it bothered me so I relaced it.